In this article we will learn using the searchView widget using V7 support library and resolving the most common errors while using the searchView widget. We will get into it later but first let us look at the things we need in order to get a search widget working. 1. We need an activity to have the search widget. This all may seem a little complex but let's begin and it will all make sense and come together. First create a menu in res/menu folder with searchView item to be shown in Toolbar(Action bar). Name the menu menu.xml. 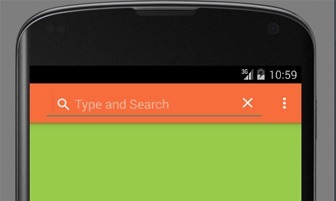 If you want to show the searchView icon permanently then you can set app:showAsAction="Always". If you set this to ifRoom, then it will be available only when there is room on the toolbar or else it will be available if you click on the options icon(Three vertical dots). Don't forget to add app:actionViewClass="android.support.v7.widget.SearchView" if you want to support earlier versions also. 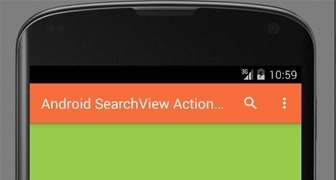 Or else if you are developing for android 3.0 or above you can write actionViewClass="android .widget.searchview. NOTE- We are using support library that's why we used menu.findItem. If you are not using support library then you can directly use menu. Know the Difference Between using Bundle and PutExtra? StartActivity for result or StartActivty?